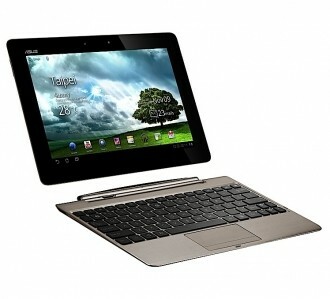 Asus has announced that their Eee Pad Transformer Prime 'hybrid' tablet will be available for purchase worldwide in December. The tablet will be the first to launch with Nvidia’s quad-core Tegra 3 processor, codenamed Kal-El. We had our first glance at the Transformer Prime last month when Asus chairman Jonney Shih briefly showed the tablet during an interview at conference AsiaD. Specifications at that time were limited but we now know all of the juicy details. Nvidia’s quad-core (technically it has five cores) Tegra 3 SoC will indeed power the unit, a chip that Nvidia says is five times faster than their Tegra 2 overall. More specifically, web browsing will be four times faster and graphics will perform three times better than its predecessor. Additional specs include a thin 8.3mm (0.33-inch) body that weighs only 586g (1.29lbs). The 8MP rear camera features an LED flash, F/2.4 aperture and a back illuminated CMOS sensor with low-light noise reduction. A 1.2MP shooter can be found on the front and a 1280 x 800 resolution Super IPS+ display coated with Corning Gorilla Glass features a max brightness of 600 nits. The Transformer Prime will ship with either 32GB or 64GB of internal flash storage and both feature a micro SD card slot for expansion and easy file transfers. Other standard features across all models include 1Gb of system memory, a 3.5mm combo audio jack and a micro HDMI port . Battery life is rated at a full 12 hours on the tablet and 18 hours when using the optional dock. Pricing will range from $499 for the 32GB model to $599 for the 64GB version while the optional mobile dock accessory will set you back another $149. The tablet will initially ship with Android 3.2 although we suspect an Ice Cream Sandwich update won't be too far off.